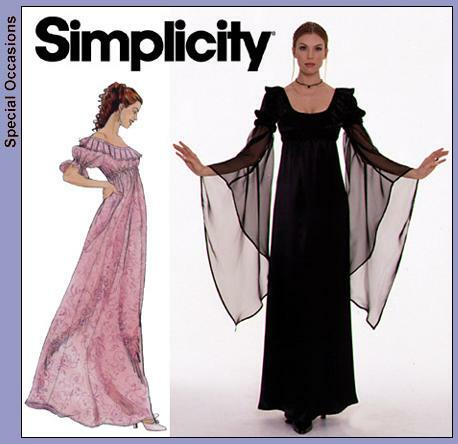 I chose a style best described as "Spooky Formal:" A black velvet gown with "vamp" sleeves, velvet-and-tulle veil decorated with skull beads, and a sort of Romantic Gothic hairstyle and accessories. 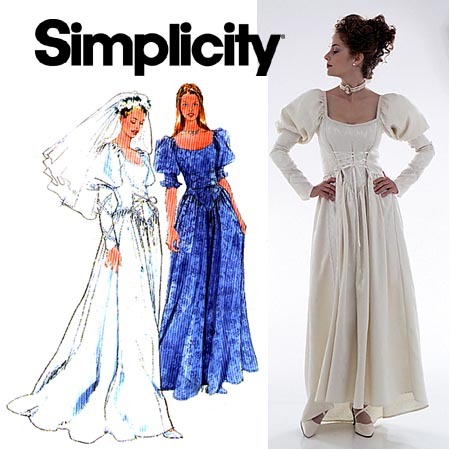 My dress was a composite of two Simplicity patterns; I used the sleeves from one and the dress body from the other. The dress was made of black velvet; the sleeves were a black sheer material. Source Sleeves were from this pattern (#8619). Source The dress body was from this pattern (#8502). Project I found the veil on e-Bay, but it would be easy to make a similar one. 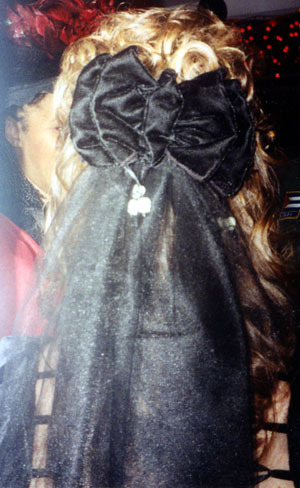 It was a black velvet bow with black tulle attached. Dangling from the bow were several little skull beads. Source My nylons had a spider-web design. Source After much deliberation, I decided upon a "granny" shoe. 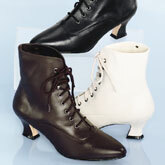 I also considered getting some black velvet pumps and embroidering silver spider webs on them. Project I made two garters--one to throw, and one for my husband to keep as a memento. 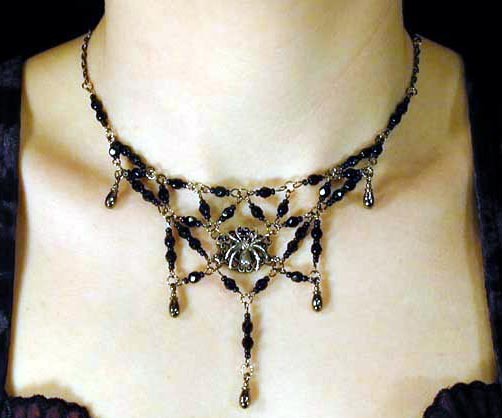 Source My necklace was a marvelous Victorian swag with a spider as the central element. I found it on e-Bay, but the manufacturer also has a Website (see Sources). 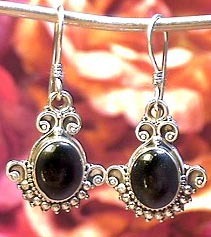 Source My earrings were elaborate black-and-silver jobs which I also found on e-Bay. I also wore a simple round onyx stud in the second hole in my left ear. My sister wore the matching one in her left ear. 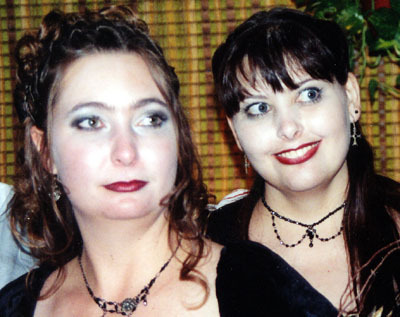 My sister (the matron of honor) and I had our nails, hair, and makeup done in a similar style. We got fairly long false nails, and brought our own polish--a deep blood red (almost black). The hairdresser really got into the spirit of things. We explained what the wedding was going to be like, and she outdid herself. I had wanted to have my hair done in a romantic upsweep, similar to a picture I'd seen of Theda Bara (see Hairstyle Suggestions), but my fiance decided that the scooped neck of my gown required a "down" hairstyle. 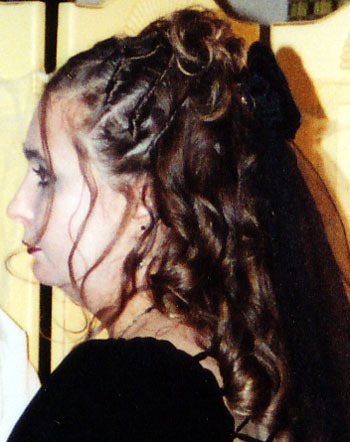 The stylist twisted the hair on top of my head and pulled it back to the crown, attached the veil, then foofed the rest of my hair around my shoulders. The same stylist did our makeup, and she went all out. We both got pale faces, dark eyes, and blood-red lips with a black gloss. We definitely looked like Queens of the Darned. I carried the Bouquet of Doom: Curly willow, fuller's teasel, dried roses (including two special ones: One from each of our grandmothers' funerals), and wheat, wrapped in black lace and ribbons. This was a very scary bouquet. I found all of the flowers at the local craft store. After the wedding, I got a pretty urn and turned the bouquet into a flower arrangement for our dining room.